Hey guys, I'm here in Nashville to partner with Mocha Club since we didn't get to go to Kenya this week and whether you're here or not, I'd love for you to be a part of what's going on here. 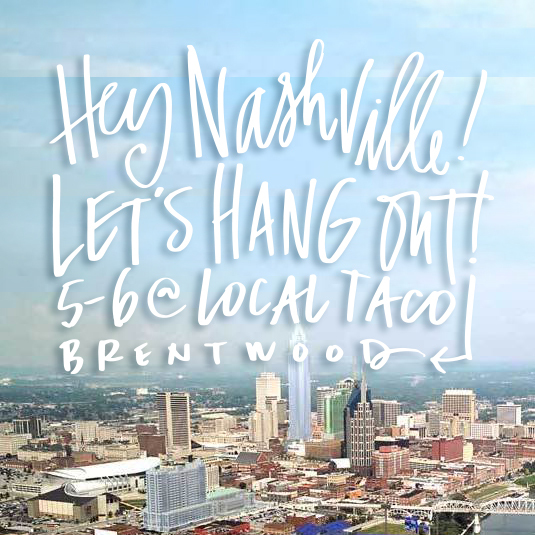 If you're in Nashville: We're meeting at Local Taco in Brentwood to have a quick meet up before we have a simulcast from Mocha Club headquarters. Annie Downs, Lindsay Sherbondy, and Marisa Pardo and I will be at Local Taco tonight at 5pm EST to hang out, meet friends, and chat. Shortly after that, we'll head to the Mocha Club headquarters to have a live online event to support and fundraise for New Dawn School and we'd LOVE for you to join us for that party as well. If you're NOT in Nashville: you can totally join us online for the event tonight. Lindsay and I are going to be giving away a collaborative print that we work on together to anyone who signs up to support the New Dawn School in Kenya. We'll also be giving away some of Annie and Nish's amazing books, with a lot of other fun surprises too. You can watch on twitter, instagram, or Facebook to get the information for tonight's event! Please follow along on instagram all day we show some behind the scenes at Mocha Club and this makeshift #KenyaMocha trip that got relocated to Nashville.